Alzheimer’s disease (AD) is a type of neurodegenerative disorder which is responsible for many cognitive dysfunctions. According to the most accepted cholinergic hypothesis, cholinesterases have a major role in AD symptoms. The use of small molecules as inhibitors is one of the most useful strategies to control AD. In the present work, a series of N-phenylthiazol-2-amine derivatives was screened against acetylcholinesterase (AChE) from Electrophorus electricus and butyrylcholinesterase (BChE) from horse serum by using Ellman’s method, using neostigmine and donepezil as reference drugs. Some of the assayed compounds proved to be potent inhibitors for AChE and BChE activity. 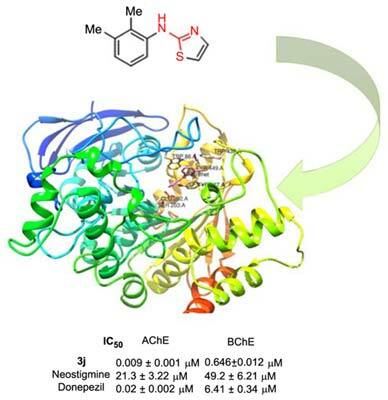 N-(2,3-dimethylphenyl)thiazol-2-amine, 3j was found to be the most active inhibitor among the series with IC50 value of 0.009 ± 0.002 µ M and 0.646 ± 0.012 µM against AChE and BChE, respectively. Molecular docking studies were carried out in order to better understand the ligand binding site interactions. N-Phenylthiazol-2-amine, Alzheimer's disease, acetylcholinesterase, butyrylcholinesterase.